The submissions have come in for the 2016-17 CAS-CIAC Battle of the Fans competition, and among the many great entries three finalists have been chosen. Congratulations to Immaculate High School, Notre Dame-West Haven, and Simsbury High School who have been selected as the three finalists. 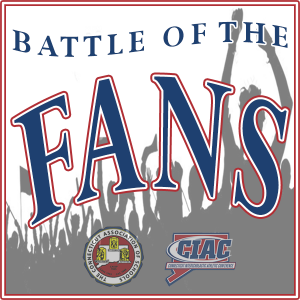 CIAC staff members will visit each school to talk with student-leaders and administrators soon, and then the 2016-17 CAS-CIAC Battle of the Fans winner will be announced on March 10. Of the submissions these best represented the criteria of CAS-CIAC Battle of the Fans which is to encourage positive fan behavior from school student sections and highlight the great things schools are doing to promote sportsmanship and supportive fan conduct. It’s not just about having the rowdiest fans, the videos and entries should highlight the school’s commitment to positive sportsmanship, and school spirit. Check out the three finalists below (in alphabetical order) and look for the announcement of the winner on March 10.